Whether for a school project or fun activity with the kids, papier-mache is one of those crafts that doesn't require any special supplies. The papier-mache paste is a simple mixture of flour and water, and you can use many items found around your house to make molds and forms for your projects. It's a great way to recycle. Some of these items can be used as bases for the papier-mache object, while others can be used to add specific details to the project. It is likely that you have a few balloons stashed away somewhere in the house, leftover from a birthday party or other festive celebration. All sizes and shapes of balloons (and it doesn't matter what the color is) are great to use as bases of round designs such as heads and masks. A balloon is also a perfect base for a pinata. Don't throw away that extra cardboard from a package, or recycle the food boxes just yet. Different types of cardboard work well—corrugated cardboard is great for creating certain types of project bases, and lightweight cardboard, like from cereal boxes, works well when adding smaller details. Not all of us have chicken wire lying around the house, but it is pretty easy to come by. Its flexibility, scale, and its ability to easily connect pieces make chicken wire ideal for crafting bases for large projects. 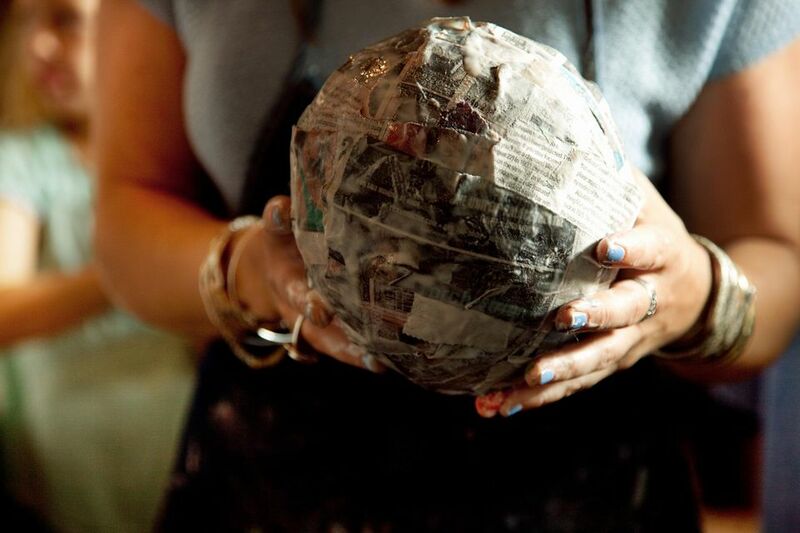 Besides being a key ingredient in the actual papier-mache process, you can use newspaper for creating details on your project, especially those shapes that are asymmetrical or somewhat awkward, since you can twist and form the paper into whatever size and design you need. You can also roll it up to make an arm or leg, or crumple it up to make a ball for a part of your structure that is round. Shoe boxes aren't just for dioramas when it comes to projects—they can be very useful when you need a sturdy base for papier-mache. Or cover the box to create a special treasure box or decorative container to store special items or give as a gift. Easily forgotten and often tossed out, cardboard toilet paper and paper towel rolls are actually very useful in the craft room. When it comes to papier-mache structures, they are great for adding details like arms and legs. If you have multiple pieces to your structure's base you will need to secure them to each other. Masking tape is great for holding all of the base pieces together while you apply the papier-mache.